Manufactured in-house the JAYSON has a proven track record for usability, durability and reliability. The core is encapsulated in a hardwearing, impact and abrasion resistant polymer which makes the JAYSON hard wearing and the switch is positioned on the spine of the yoke to minimise the profile of the yoke. 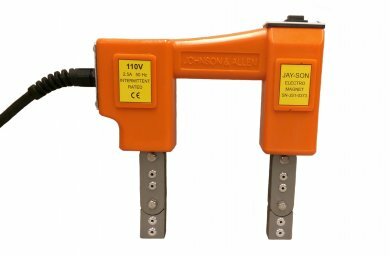 Like other Johnson & Allen yokes the JAYSON is fitted with a self-resetting thermal cut-out to prevent burnouts from misuse. The JAYSON is supplied lift tested with certificate of conformity and in a heavy duty canvas bag as standard. Replacement parts also available - Including pairs of complete leg sections, pairs of just the feet sections, micro switches, switch covers and rubber membranes etc.